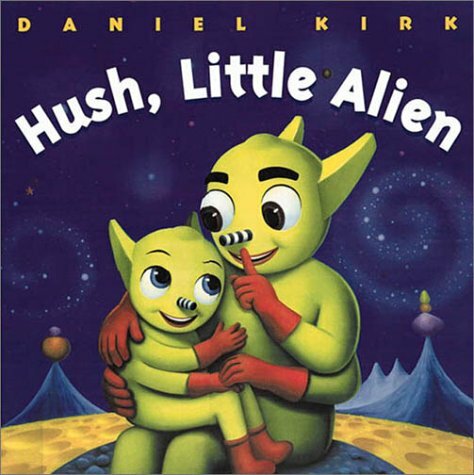 Hush Little Alien by Daniel Kirk is out of print?? SO SO SO WRONG. Josie’s fave picture was the astronaut punching the big alien in the face. (I’m making this book sound way more violent than it is. The punch is more of a cranky pop. I swear the book is sweet and loving, about a little alien taking a trip with his or her daddy. Gender neutral protagonist: also good!) Josie would stab a chubby finger at the page and say “Boy! No fightin’!” Good times. Not to overanalyze, but another fab thing about the book is that the little alien has way more agency than the passive baby in the original folksong. I don’t want to spoil it for you or your progeny (there are used copies available on the Interwebs), but in this version, the little alien makes a mistake and the big alien not only forgives, but gives him/her/it the tools to correct it him/her/itself. Great lesson for the wee. Hyperion! Somebody! GET THIS MODERN CLASSIC BACK INTO PRINT! I WILL BUY COPIES FOR EVERY NEW BABY I KNOW!